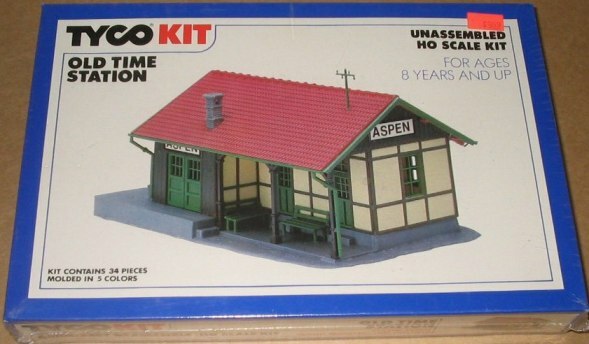 This small train station model has a place of some significance in the TYCOKITS line, the Old Time Station (No.7728) may be the last addition to TYCO's HO-scale kits. Listed as a new item in the TYCO Fall 1991 catalog, the Old Time Station is only presented this first year and again in the 1992 catalog. 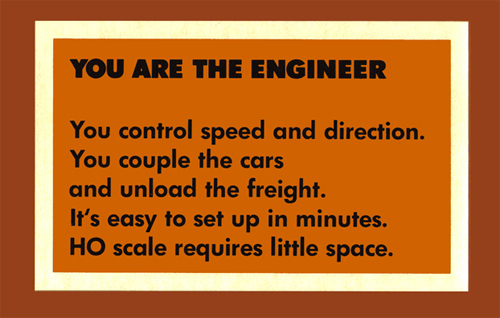 TYCO lists no kits in its 1993 catalog, which is the final one to included HO-scale model trains. There are two additional TYCOKITS that carry notation of being new for 1991, the Truck Terminal (No.7758) and Three Houses Under Construction (No.7759). 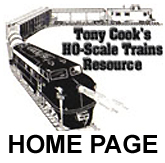 Both kits however had been previously included in TYCO's line and are not new offerings. The Old Time Station TYCOKIT is listed in the catalog as including 34-pieces molded in five different colors. Measurements for the finished kit are listed as being 6" x 4" in size. It should be noted that though this TYCOKIT is reviewed among "Brown Box" Era offerings, it actually is known only to exist in a box with blue borders. In the very late years, TYCO did move away from the typical brown bordered package that was used beginning in the early 1970s. Brown switches to blue for the items that remain in the very late 1980s through 1993. This Old Time Station kit is one item that only is found in a "Blue Box" package. TYCO's Old Time Station was produced by Pola in West Germany. Though TYCO would not catalog this model until the early 1990s, Pola included this kit in its 1970s Pola-Quick HO line as the Country Station (No.803).